VR T320 trundles along the main to the siding for its shunting duties for the day. These are some suggested changes to the T320's engine file to give more prototypical performance. The changed values below are taken from John Cleverdon's Locopage specifications. 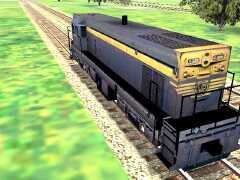 As well, rather than using the default GP38 cab, for a more realistic driving experience use a GP7 or GP9 cabview. The T320 & T322 designer, Gavin Mclaughlan, has set them up for long-end driving so a GP38 cabview makes it too easy. A GP7 or GP9 cabview makes the driving experience more realistic by allowing the driver to only see down the right-hand side of the loco (the GP7/GP9 cabviews are set up for U.S. right-hand driving). 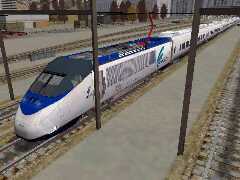 Naturally, you'll need Gavin's VR T-class locos, vr_ts.zip (1.9Mb, 14-Jun-02) from the Train-Sim.com file library. 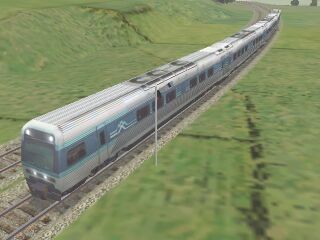 At the time of writing (16-Jun-02), the cabview for the GP7 by Sam Spade, gp7cab.zip (2.6Mb, 17-Nov-01), is being tried here at webTrainSim. Extract the EXE, check for viruses, and run the installer. The GP7 cab is installed in the Common.Cab folder. Note you must also extract corrected CVF files from NewCVF.zip - full folder paths to the ACE graphic files in the originals weren't completed and these CVFs fix that omission. This is not the last word on changing some values for the T-class locos to achieve more realistic performance. At the moment, webTrainSim hasn't reference to detailed documentation on loco and engine specifications so parameters, such as above, are gleaned from some web sites. Throttle ( 0 1 0.125 0 0. Following on from Barry Andrews' work with an inside passenger view accessed with the "5" key (see More GP38-2 cabviews), webTrainSim has commented out the Inside block for the T320 while testing the changed parameters and the GP7 cab. If you want to keep the inside passenger view, then make the changes suggested by Barry in More GP38-2 cabviews. Further down the ENGine file, you'll find the following. webTrainSim hasn't any specs to determine whether the Xplorer power cars have gears or not. The settings below give the Xplorer only 1 gear, as do severall DMU sets of the U.K., such as the Regional Railways Class 153. Other parameters call for change, namely the engine RPM values, and the GearBoxMaxTractiveForceForGears which currently is set for the lower-powered Kiha 31 power car.